I am relieved to learn that my prior observations (see also Sutton 2016) that Wikipedia’s paid personal agenda editors are operating throughout the entire Wikipedia encyclopaedia to subvert the truth and bury annoying and uncomfortable dis-confirming facts for the “majority view” has been firmly confirmed by the research of other academics. Click here for an overview of my personal experiences with Wikipedia editors engaging in systematic fact deletion. Wikipedia needs investigation by the FBI. Because its owners claim it is an objective encyclopaedia edited by the general public. On those grounds it seeks sponsorship via the public for donations to keep it going. In reality it is secretly earning money on a “fact deleting paid-to-lobby” basis. This corporate activity stinks to high heaven of corruption, fraud and organised crime. 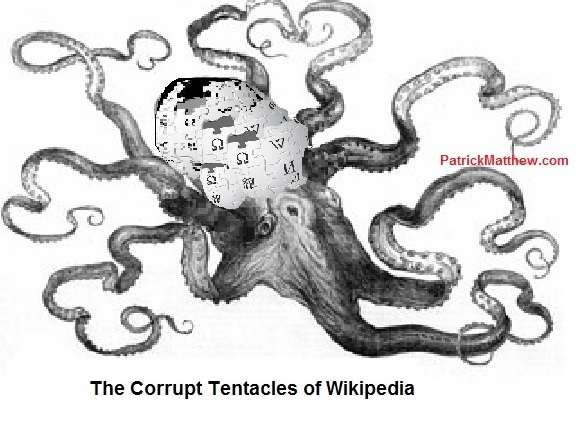 Wikipedia editors are gaining a pecuniary advantage by deception. I am prepared to testify!